He caressed her cheeks. ‘Everything’s been worked out well’. He looked at his watch and then at Grace. It’s time to go, sweetheart. She stood motionless, gazing at the door. Mani knew he would never walk through that door again. He pulled her closer. ‘Remember, one wrong move and we’re done’. Flight Lieutenant Mani Shankar Varadharajan vanishes without a trace on a cold winter’s night. Did his aircraft really crash or was it a diabolical plan hatched in collusion with his stunningly beautiful wife, Grace, in a desperate bid to salvage their faltering marriage? As the years roll along, Grace embarks on an unexpected journey that takes her back to her complicated past. Will she find what she was seeking or will her high-stakes game prove disastrous for her? 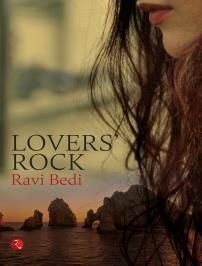 Predominantly set in the glamorous Goa of the 1960s, Lovers’ Rock is a high-octane story of obsessive love, passion and retribution. An un-putdownable romantic thriller that will leave you chilled to the bone. Set in 1960’s ‘Lover’s Rock’ is tale of obsessive love, greed, vengeance and redemption. The entire tale gives tantalizing glimpses of lifestyle of elite Indians in that era. The book is a brilliant portrayal of post independence lifestyle of a section of Indians still immersed under British influence—the world of lavish parties, free flowing wine, and silk gowns. Mani Shankar, aka Shanks, is madly in love with gorgeous Grace, and couldn’t believe his luck when she agrees to his marriage proposal. The trouble starts when he is unable to finance her expectations of a lavish lifestyle. His obsession with Grace leads him to unchartered web of lies and deception. The unpredictable twist in the end makes the novel remarkable. Author has expertly etched Mani’s character as a besotted lover and husband. His journey is something which keeps the readers turning the pages. Grace is a typical beautiful lady who thinks the world owes her everything she wishes; and that leads to myriad complications which slowly spiral out of their control. Mr. Bedi has given complete attention to the supporting characters as well, be it Tanya, Mr. Pestonji or Mark. All the characters complement the story and the protagonists. The narration is fluent and interesting, bringing alive the picturesque locales, beaches and scenes. The book is fast paced and brilliantly written. There are two things which I found lacking. Mani’s obsession and fear that his wife would leave him, and later her depression was dealt with too quickly. Their emotions did not stay with me, and the story jumped to the next step too soon. Another thing which confused me a little was the shifting timeline of the events happening in the lives of Mani and Grace—mainly in the middle of the novel. It was a little jarring when I had to go to and fro to maintain the calendar in my head. I wished somehow Mark should also have been exposed, but then that is the author’s prerogative. Nevertheless it doesn’t take away anything from the story. All in all a very intense debut and I look forward to the next one from the author. Disclaimer: The book was given to me by the author for an honest review. Ravi Bedi, ex-Air Force engineer, musician, painter and now a prolific writer, lives with his wife of forty-nine years in Jodhpur.